I like big ambitious ideas. And this is one I am involved with. The video is from Belfast Live. More of the story here. 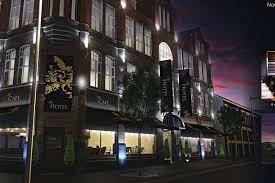 The plan is to open a hotel on Belfast’s Shankill Road. The building is over 100 years old – The foundation stone for The Shankill Road Mission was laid 23 October 1897. More than being a place of worship, the mission had an unparalleled social impact on the area. In a climate of social deprivation and poverty. The founder, Rev Montgomery, introduced radical measures to improve the lives of the poor in that part of the city. Medical treatment, food, clothes and even holidays were provided to the needy. it is essential that the building remains part of those community assets. It would be an enormous advantage if it were to play a central role in the economic and social re-development of the area. That big plan is a hotel with an objective to provide hospitality training for people of all ages. Belfast has become increasingly popular as a visitor destination. There is still capacity for hotel rooms. Yet there are not enough people trained in hospitality to a high standard fill the employment gap. One of the chief ambitions of the project is to fill the hospitality skills deficit.